I started to compile this post about three days ago, but this week has been so busy I just haven't had much time to be able to just sit down and write. But, I wanted to address a couple comments that were made to me earlier this week in conversation I had with someone. When someone asks me about my experience or ask for my advice, the passion I have for health and fitness just kind of takes over. But, from time to time, I get replies that make me leave the conversation wondering if what I really said made sense to them or made a difference. I know, just because someone questions me about health and fitness, doesn't mean they are wanting to change anything in their lives; but they are just simply curious. And I would never turn any conversation into a lecture, or try to tell someone what they need to do, because until they are ready to make the changes anything I say or do won't matter anyway. But, I do always try to make sure they understand how much my life has improved by working out and eating healthier. And the other day I had a lady ask me multiple questions about what I do for workouts, my nutrition, and where I train. I can typically tell if someone is asking questions because they are interested in making changes in their own life, or if they are just curious. Either way, I don't mind answering questions, but she said a couple things that made me grateful that I didn't settle for less by choosing Michael Watkins and Fitness Together. This past Tuesday I had a VERY intense leg day, in fact my legs just started feeling somewhat normal yesterday, and this conversation took place on Wednesday. One of the comments she made was after I told her how my trainer doesn't let me slack and always pushing me beyond what I think I'm able to do. Her reply to that was, "That's why I like the place where I go, they don't make you do something if it's hard or if you don't feel like doing it." I can't remember where she goes, but it's some ladies group program. But, it got me thinking, and it's like Michael always says when I'm complaining something is hard, "If it wasn't hard, everyone would be doing it." I will be the first to admit, when I'm in the middle of a tough session, I get pissed at Michael because all I want to do is stop or do something easier, and he's over there saying things like, "I thought you had goals to meet." or "Oh, it's hard? Okay, keep going." But, afterwards, I'm always grateful he didn't let me slack or take it easy on me. If it's not hard, then I'm never going to change, and I'm never going to get the results I want. So, even though there are times that I don't know if I can make it through the workout, I'm grateful Michael never takes it easy on me. The other comment she made was regarding where I train and the cost. I never go into the cost of what I personally pay, one because what I pay is my business, but also because the cost depends on what you choose to do. You have so many options with Fitness Together, from private one-on-one sessions, semi-private, or group sessions. And it can also depend on how many days a week you commit to as well. I just know, getting into what I pay isn't important, so I just stick with what the average session can cost depending on what they want out of it. Well, her comment to that was, "You could probably find something cheaper somewhere else. Have you researched other places?" Of course my reply to her was that I did research over three years ago and that's why I chose Fitness Together, but the cost wasn't the main factor. My research was to make sure I was getting the best service, because as my Mom has always said, you get what you pay for. So, when I make any type of investment, especially when it comes to my health, I'm not going for cheap but I'm going for the best. Now, I know, some people are saying, but not everyone can just go out and hire a personal trainer. 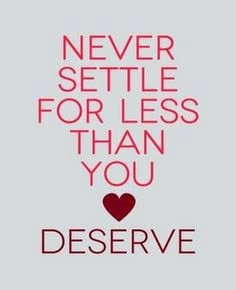 And I totally understand that, but what I don't want people doing is settling for less than they deserve. Everyone deserves to be healthy and happy, so when you're searching for what is BEST for YOU, make sure you don't settle for cheap and easy! Make sure you only get the best, because that's what I did when I committed my life to Michael Watkins and Fitness Together!